With Readly you can read Imagine FX Annual and thousands of other magazines on your tablet and smartphone. Get access to all with just one subscription. New releases and back issues – all included. 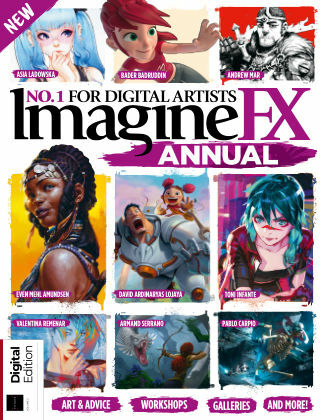 "A compilation of the very best content from ImagineFX magazine over the past year, this bookazine is packed with fantastic tutorials to help you master traditional and digital art. Divided into clear sections covering artist portfolios, workshops, sketchbooks and traditional art, we’ll show you how professional artists collaborate on projects and reveal what’s in their sketchbooks, how to paint bright and dynamic figures, create striking paintings and illustrations, and much more. Our extensive Q&A includes expert advice and tips on how to get the most out of your projects. Inside you'll find: - Tobias Kwan Disturbing intertwining elements share a page with delicate portraits	- Elijah McNeal Industrial sci-fi floats this concept artist’s boat, he makes character studies too - Anna Dittmann A portrait illustrator that stays on top of her game with sketchbooks full of life studies - Giorgio Baroni This artist likes nothing more than mixing past and futuristic concepts - FXPosé Traditional Showcasing a selection of the finest traditional fantasy artists - Character design in Copic markers Discover how Asia Ladowska blends pencils and markers expertly - Warming up to watercolour Join artist and teacher Kelly McKernan in discovering how to work with watercolour - Armand Serrano Learn how he went from failed civil engineer to successful Disney animator - Romain Van Den Bogaert Find out more about this artist’s highly unusual career change - Valentina Remenar Discover why great art is about more than putting technical skills into practice - Pablo Carpio From having no job to working for Disney and Marvel	- Plan and paint a striking figure Learn how Even Mehl Amundsen solves lighting and anatomy problems as he paints - Use greyscale to render figures Discover how David Ardinaryas Lojaya is able to create a dynamic character illustration - Create a landscape in Quill and Oculus Martin Nebelong shows how he sketches and develops immersive landscapes - Create intrigue in your work Ann Maulina draws and colours promotional art for her own webcomic - Capture the feel of The Road Dave Kendall steps onto Cormac McCarthy’s Road to illustrate a moment of trepidation - Drawing & Inking with confidence Andrew Marr takes you through his creative process - Rapid posing skills in Maya Bader Badruddin encourages you to stop over-analysing your character - Be inspired by a manga classic Toni Infante taps into the influence of Akira and uses colour and contrast’ - 15 ways to be a better artist Learn the tricks of the trade from a concept artist - FXPosé Discover some incredible digital art from artists around the world’ - Artist Q&A Struggling with a painting technique or topic? The answer may be in these pages"